Perhaps it was the beautiful fall day that drew persons to finish yard work and farmers to their harvesting, but there was somewhat less-than-usual attendance at our annual Menno Clinic Curry Bash on Saturday, October 24. Those who weren’t able to attend missed a delightful selection of carry-in foods in addition to the traditional tasty chai, rice, and curry. Though there was not an official theme for the speakers, the recurring message of the evening” was that of connectedness and relationships. 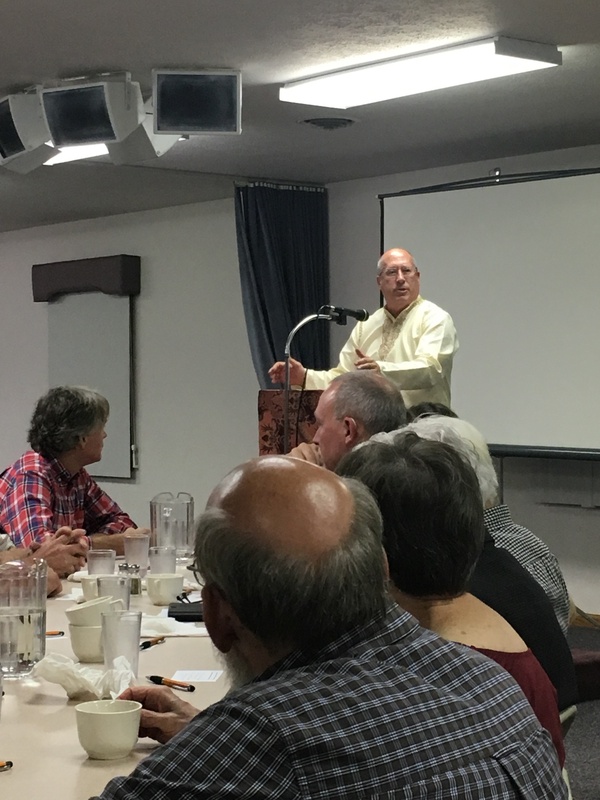 “Primary to our connection with others is our connection with God,” John Murray, Chairman of the Menno Clinic Board, reminded us. John 1 tells us that out of God’s great love for us, his Word became flesh, assumed human form and took up residence with us in the person of Jesus. Because of this, we experience the presence of God when we are able to look into one another’s eyes and feel their joy or pain, love or sorrow. In turn, we also can open our heart to them. “God is love, and where love exists, God is there,” John said. “To meet Christ you need not look farther than your neighbor.” Doc Yarlagadda clearly stated in his closing talk when he posed the question, “Where do you go to find God?” Many would search in a church service, a Bible study, Sunday School class, or in quiet meditation. He went on to tell the story of Yakabu, the elderly man from the “untouchable” community in Chiluvuru. His act of humble service in cleaning human excrement from John Murray’s shoe (a hazard when walking the path to the outcaste ghetto of the village) was a demonstration of the love of Christ that touched John deeply. John found a way to respond in kind by publicaly washing Yakabu’s feet (unthinkable in Indian society) at the dedication of the Clinic in 2002 . In Christ, the societal barriers of race, education, wealth, and social standing are abolished. For those who have had the privilege of visiting the Clinic, it has often been a life changing event. Kara Yoder, now a nurse from Kalona, Iowa, shared how Menno Clinic changed her life. She travelled to Chiluvuru with a group of nursing students while enrolled in Hesston College 5 years ago. 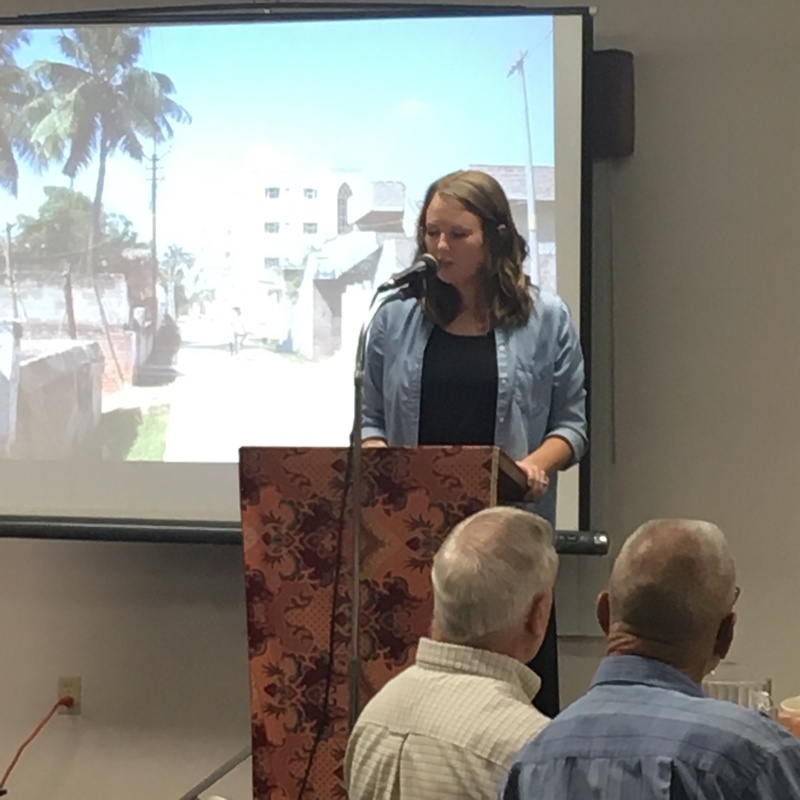 During the flight back to the US, she reflected and asked herself the question “What difference is this going to make in my life?” This question smoldered until earlier this year when she shared her experience with her pastor, hoping he would bring the ministry of Menno Clinic to the congregation. With his encouragement, Kara shared her experience. She was able to relate not only her story, but challenge the church to use the seed money of a dollar bill to make a difference in someone else’s life. One does not need to travel to India to share in and experience the difference that Menno Clinic is making the village of Chiluvuru and the surrounding community. Brenda Yoder, our newest board member, shared how we are excited about the possibilities that social media platforms like Facebook, Instagram, and Twitter offer in terms of keeping our constituency informed, especially the younger generation. We have committed ourselves to provide timely and regular reports, so join us by” liking” us on Facebook, Instagram, and Twitter to stay connected. Also, share us with your friends. Thanks to all who have faithfully supported the vision of the Clinic since it was conceived, as well as those who have recently joined this international, intercultural, Christ centered, peace oriented, relationship promoting, healthcare project. Your support makes all the difference. You can do so by clinking the “Donate” tab at the top of the page.